April: Congratulations to Kenton Hicks for winning an award for his poster at the Catalysis Club of Chicago Spring Symposium! April: Congratulations to Kenton Hicks, Megan Wasson, Sylvia Hanna, and Riki Drout for being recognized at the The Graduate School’s Spring Reception! Kenton was awarded honorable mention by the National Science Foundation (NSF) Graduate Research Fellowship. Megan was recognized for receiving a NSF Graduate Research Fellowship. Sylvia won the Department of Energy National Nuclear Security Administration Stewardship Science Graduate Fellowship. Riki was recognized for being a Ryan Fellow this year. March: The Farha Group says goodbye to visiting scholar Jiafei Lyu. Jiafei is returning to China to finish up her Ph.D.
March: Congratulations to Sol Ahn for successfully defending his Ph.D. thesis! January: The Farha Group welcomes Seung-Joon Lee from Yonsei University in Seoul, South Korea. 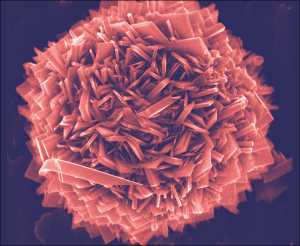 Seung-Joon’s research will be focused on the use of MOFs for gas storage and separation. Welcome, Seung-Joon! November: The Farha Group welcomes four new graduate student members: Julia Knapp, Karam Idrees, Florencia Son, and Zoha Syed. Welcome to the Farha Group! October: Congratulations to Jiafei Lyu for her well-earned recognition in NUANCE’s annual “The Art of Science” image contest! Jiafei’s image, titled “Bloom”, placed third in the web division. October: The Farha Group welcomes two new visiting scholars this month: Yongwei Chen from South China University of Technology and Md. Rasel Mian from Tohoku University. Yongwei will be with the Group for two years and Rasel will be with the group for a year and a half. September: The Farha Group welcomes visiting scholar Kaikai Ma from the Hong Kong Polytechnic University. He will be with the Farha Group for one year. August: The Farha Group says goodbye to visiting scholars Tae-Ung Yoon and Ah-Reum Kim as they return to South Korea to continue work on their PhDs. August: Sylvia and Peng traveled to the University of Notre Dame for the Actinide Center for Excellence Annual Review Meeting. Sylvia presented at the meeting – check out a photo of her presenting in the Gallery page! August: Congratulations to Peng Li, Yijing Chen, and Lee Robison for being named Center for Molecular Innovation and Drug Discovery (CMIDD) Scholars! They were selected after applying for the award, which recognizes contributions to the field of biomedical research. Up to 12 researchers are recognized each year (6 grad students and 6 postdocs) so the Farha Group is especially proud to have 25% of the award recipients! Peng, Yijing, and Lee will be recognized at a colloquium event later this month. August: The Farha Group welcomes visiting scholar Rodrigo Gil San Millán from the University of Granada. August: The Farha Group says goodbye to Kenichi Otake. He is moving to Kyoto, Japan to accept a position as Assistant Professor at the Institute for Integrated Cell-Material Sciences at Kyoto University. Congratulations, Kenichi! August: The Farha Group says goodbye to Aaron Peters as he moves to New Jersey to start work with Exxon Mobil corporation. The Farha Group also says goodbye to Zhanyong Li as he starts a new job with Honeywell UOP here in Illinois. Congratulations and best of luck to you both! July: The Farha Group says goodbye and good luck to Chung-Wei Kung. He is returning to Taiwan to begin work as an Assistant Professor in the Department of Chemical Engineering at National Cheng Kung University. Congratulations, Chung-Wei! July: Congratulations to Dr. Aaron Peters for successfully defending his dissertation to receive his PhD! July: Congratulations to Riki Drout for receiving the Ryan Fellowship. Given by The Graduate School at Northwestern University, the Ryan Fellowship “supports the finest graduate students in the country and provides them with the education and experience to assume leadership roles in the realm of nanotechnology.” The interdisciplinary nature of nanotechnology means Ryan Fellows are selected from a broad spectrum of programs and schools, including: the Robert R. McCormick School of Engineering and Applied Science, the Judd A. and Marjorie Weinberg College of Arts & Sciences, Feinberg School of Medicine, and TGS Interdisciplinary Programs including: Driskill Graduate Program in Life Sciences (DGP), Interdisciplinary Biological Sciences Program (IBiS), and Northwestern University Interdepartmental Neuroscience Program (NUIN). July: The Farha Group says goodbye to visiting scholar Ghada Ayoub. She returns to McGill University in Montreal, Canada to complete her PhD. July: The Farha Group welcomes visiting postdoc Fenfen Wang, who joins us from the Guangdong University of Technology. June: The Farha Group welcomes Cornelius Audu as a postdoc. Cornelius recently earned his PhD in Hupp and Nguyen groups at Northwestern and is now doing work in the Hupp and Farha groups. June: Congratulations to Riki Drout for receiving the L. Carroll King Award for Excellence in 100-Level Teaching. Given by the Northwestern University chapter of PLU, the award recognizes excellence in student teaching. These awards are distributed among graduate students teaching at all levels of the undergraduate and graduate chemistry curriculum. Riki is one of just two recipients of the 100-level award in the department for the 2017-18 school year. May: Congratulations to Peng for having the featured/cover article in the May 10, 2018 issue of Chem for his article “Hierarchically Engineered Mesoporous Metal-Organic Frameworks toward Cell-free Immobilized Enzyme Systems.” See the image in the Gallery. May: Peng Li will present the SPIE (Society of Photo-Optical Instrumentation Engineers)-MRSEC (Materials Research Science and Engineering Center) Student Seminar Series on Wednesday, May 9. Peng’s talk, “Encapsulation Enzymes in Metal-Organic Frameworks for Catalysis,” is based on his work as a postdoctoral fellow in the Farha and Hupp groups. We are confident Peng will do a great job and represent NU Chemistry well at the McCormick School of Engineering event. May: Congrats to Yijing for passing her Qualifying Exam! May: The Farha Group welcomes postdoctoral fellow Zhijie Chen. Zhijie recently completed his PhD at King Abdullah University of Science & Technology (KAUST) in Saudi Arabia in the research group of Prof. Mohamed Eddaoudi. April: Riki, Sylvia and Peng traveled with Omar to Santa Fe and Los Alamos, New Mexico, to attend the NNSA Actinide Center for Excellence All-Hands Meeting. April: Congrats to Riki for passing her Qualifying Exam! April: Congratulations to Riki Drout for receiving a 2018 Innovations in Nuclear Technology Award, given by the U.S. Department of Energy, Office of Nuclear Technology Research and Development. Riki was awarded first place in the Material Recovery and Waste Form Development category. In addition to cash prizes, award winners may have opportunities to participate in events such as the 2018 Nuclear Technology R&D Annual Meeting, the 2018 American Nuclear Society Winter Meeting, and an Innovators’ Forum, a forum designed to engage students in advancing innovations in nuclear technology research. April: Congratulations to Louis Redfern for receiving the U.S. Department of Energy (DOE) Office of Science Graduate Student Research award! The SCGSR program provides supplemental awards to outstanding U.S. graduate students to pursue part of their graduate thesis research at a DOE laboratory/facility in areas that address scientific challenges central to the Office of Science mission. Louis will travel regularly to Argonne National Laboratory (Argonne, IL) to conduct research for the next year. April: Congratulations to Sylvia Hanna for receiving an Honorable Mention recognition in the National Science Foundation’s Graduate Research Fellowship program. April: The Farha Group welcomes visiting scholars Ah-Reum Kim and Tae-Ung Yoon, doctoral students at Yonsei University in Seoul, South Korea. March: Subhadip traveled to New Orleans to attend the 255th American Chemical Society National Meeting. February: Aaron Peters and Sol Ahn received PPG 4th Year ORP Fellowships in the fall quarter. This award, sponsored by PPG, is awarded by a faculty committee to 4th year grad students who presented outstanding original research projects. Aaron’s award was given by the Department of Chemistry and Sol’s PPG fellowship was awarded from the McCormick School of Engineering. February: Congratulations to Farha Group members Riki Drout, Kenichi Otake, and Timur Islamoglu (and Farha Group alumna Ashlee Howarth) for having the cover article in the Feb. 27 issue of Chemistry of Materials. Check out the cover in the Gallery section of the Farha Group website. February: The Farha Group says goodbye to visiting scholar Isil Akpinar. She will return to London to finish writing her PhD. February: The Farha Group welcomes visiting scholar Ghada Ayoub, a doctoral student at McGill University in Montreal, Canada. February: The Farha Group says goodbye to visiting scholar Johannes Osterrieth. He will return to Cambridge to continue work on his PhD. November: The Farha Group welcomes visiting scholar Yuanyuan Zhang. She is a PhD student at the Beijing Institute of Technology. November: Cassandra Buru attended the 2017 Chemical and Biological Defense Science & Technology conference in Long Beach, CA. November: The Farha Group welcomes the following first-year graduate students to the group: Sylvia Hanna, Tim Goetjen, Xinyi Gong, Kenton Hicks, Rodrigo Maldonado, and Megan Wasson. November: The Farha Group welcomes visiting scholar Johannes Osterrieth. He is a PhD student at the University of Cambridge in the United Kingdom. November: The Farha Group welcomes visiting scholar Jie Wu. He is a Professor of Chemistry at Zhengzhou University in China. October: The Farha Group welcomes visiting scholar Xingjie Wang to the group. He is a PhD student at the South China University of Technology. October: The Farha Group welcomes visiting scholar Jiafei Lyu. She is a PhD student at Tianjin University in China. October: The Farha Group welcomes Lee Robison and Louis Redfern to the group. Lee and Louis are both third-year grad students who are joining the Farha group from other research groups at Northwestern. September: Jian Liu, Zhanyong Li, and Xuan Zhang attended the Inorganometallic Catalyst Design Center (ICDC) All-Hands Meeting in Minneapolis, MN. September: The Farha Group welcomes visiting scholar Isil Akpinar. She is a PhD student at University College London in the United Kingdom. September: The Farha Group welcomes visiting scholar Satoshi Kato. He is a scientist at Asahi Kasei Corporation in Japan. September: The Farha Group is formed! The group begins with seven graduate students, eight postdocs, and one visiting scholar.